Far far away in the middle of foreign dark and cold russian land Siberia for the third time in history the strongest athletes of Russia, Europe and USA will be brought together by one of the most biggest and exciting competition in the world – Siberian Showdown! Plenty of great Crossfit Games athletes took part in SibShowdown before: Annie Thorisdottir, Frederik Aegidius, Mikko Aronpaa, Lacee Kovacs, Jenn Jones, Jonne Koski, Thuri Helgadottir. This year main event will take place in Novosibirsk Expocentre, Novosibirsk, Russia, 5th-6th December. Athletes will compete for over than $15000 prize. Categories of SibShowdown ’15 will be as follows: men, women and teams (2 men + 1 woman). To join the competition athletes must run through 2 WOD’s qualification. The first russian affiliate Crossfit Berloga and Siberian Health Corp., competition holders, invite athletes, volunteers and fans to take part in this epic event and enjoy the battle of the fittest athletes in Russia and all over the world! The competition is planned to broadcast online! 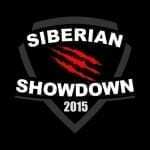 Sign up to take part, join Siberian Showdown communities in social networks and stay tuned!